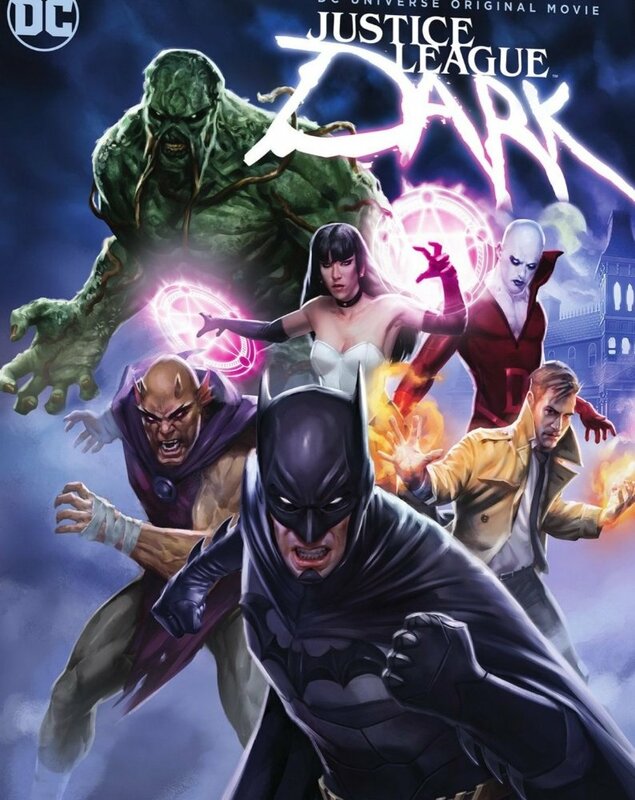 There's a new Justice League Dark animated movie out from Warner Home Video. I co-wrote the story and the screenplay is by Ernie Altbacker. From the clips I've seen, it's a good one. (I'll see the whole thing at the premiere next week in New York City.) If you've enjoyed the other DC animated features and you've got a taste for the supernatural corners of the DCU, I think you're really going to enjoy this one. Is Batman in the film for a reason beyond marketing? Personally I think DC would have been better off if they would have tried to rival Pixar films instead of MArvel's. There are so many properties that could have been a great characters that could have hit that Iron Giant nitch. You know, kids movies only in the sense that it is okay for kids, but really adults can dig them too. They already Had Batman the Animated Series do that. I suspect we'll see a big, Pixar-like animated feature—aimed at theaters, not home video—before long. The possibilities for that kind of film are limitless. Batman is an integral part of the story. At the same time, he's there to draw in people who, otherwise, wouldn't go near a JLD film. Let's face it: great as those characters are, they're not household names. Well, they better get a move on with it, because the superhero bubble will burst before too long. Personally, I'd love a big screen animated Adam Strange movie. Hey, how is that for a conversation, what DC properties should be wide release animated films? I think the more fantastical ( like Adam Strange) the more suited to animation. Aquaman would actually make a great animated film; think what you could do with his undersea world. Doctor Fate. Kirby's Fourth World. Detective Chimp. Well, that last one was a joke but as soon as I typed it I thought it was a great idea! The only problem with Fourth World is, can it be done in one movie? Would it need to be a set up for more down the line? I think people are getting sick of that. Also it may be viewed as too similar to Star WArs. Also, JSA could be really cool And probably easier than finding all the necessary costumes. Not to mention all the insane powers. Weird War Tales as a sort of animated anthology could be really cool. What about, Doom Patrol, Blue Beetle and booster gold(although I also figured out the perfect gender swap actresses for a live action if that is what it took) I mean those guys are basically cartons no matter what, Metal MEn, Plastic Man, and ..Well, Green Lantern is the obvious choice, but I'm pretty sure he is going to get a spot in the New DC Cinematic jazz, so... Adam Strange. He is the best choice in my eyes. Your turn. Nothing? Fine. If you change your mind and come up with some, just feel free to type it. I won't tell you what to do with your life. I know everyone talks about these great similarities between the Fourth World and Star Wars but, honestly, I think the stories are vastly different. Yes, the Orion-Darkseid relationship mirrors Luke and Vader and we've got the Source/Force thing, but the stories themselves take off into very different territories. Kirby's is so much more varied, so wonderfully cosmic, so rich with... Wait. I'd better stop before I outrage the SW fans! DOOM PATROL is a great idea. I wrote the DP episode of BRAVE AND THE BOLD—which featured the classic "Death of the Doom Patrol" story from the comics—and they played very nicely in animated form. George Lucas ha actually to some degree apparently said to be a comic fan. People have actually theorized some elements of Star Wars may have been inspired by the Fourth World, and Darth Vader's look by Dr. Doom. There is also now the possibility of being called a rip off of Thanos, despite Jim Starlin himself being the first to tell you he was inspired by Darkseid. It doesn't matter though, any sci-fantasy Space Opera will have parallels drawn to Star Wars. Star Wars was big enough to save Marvel comics from destruction in the 70s, it dwarfs almost any post war characters. For good or ill. I forgot Challengers of the Unknown. How could I forget Challengers of the Unknown. It is the most obvious answer... after Adam Strange. SPeaking of animated movies, I saw that you wrote the Judas Contract adaption. I am a little unsure about the property and what they will allow on it. First, admittedly I would prefer the cast of teh original comic, but such is life, so whatever. Will Terra be the same level of just irredeemably horrible? What about the less than appropriate relationship between Terra and Deathstroke? Could they possibly allow such a cynical and downbeat final scene? You can't say I'm sure. I'm just saying, the commercial ability (or lack there of) of such ideas and the reality of marketing may come into sharp contract. I'm sure you can make the two realities work... but, you know, the fan in me and all that jive. Only time will tell. For me. You already know. Actually, I didn't write that. Some websites are lifting the credits from JUSTICE LEAGUE DARK and applying them to JUDAS CONTRACT and I have no idea why. I had absolutely nothing to do with that film. Weird! Typical internet. Typical, typical internet. PffT. That's right PFFT. PFFFT on the whole internet. I just saw JL Dark. It was great. Some of my all time favorite characters are in that series and movie, and you nailed almost all of them to perfection. I noticed a couple of line "similarities" to a few classic Science Fiction movies; Star Trek V (which I know you're a fan of) and Aliens. Was that just a coincidence? Oh, and I laughed out loud a two parts too. Great movie. Glad you enjoyed it, George. A good part of the credit goes to Ernie Altbacker, who co-wrote the story and wrote the screenplay and director Jay Oliva (who also directed my two previous solo-written DCAU movies, BATMAN VS. ROBIN and BATMAN: BAD BLOOD), but I was delighted to contribute to what turned out to be an excellent film. And, yes, as far as I know, those similarities were coincidences. I'm working on another DCAU movie right now. Very excited about it, but I can't reveal details yet!